If your pups are anything like mine, then they adore that curious white powder that falls from the sky during the Winter. 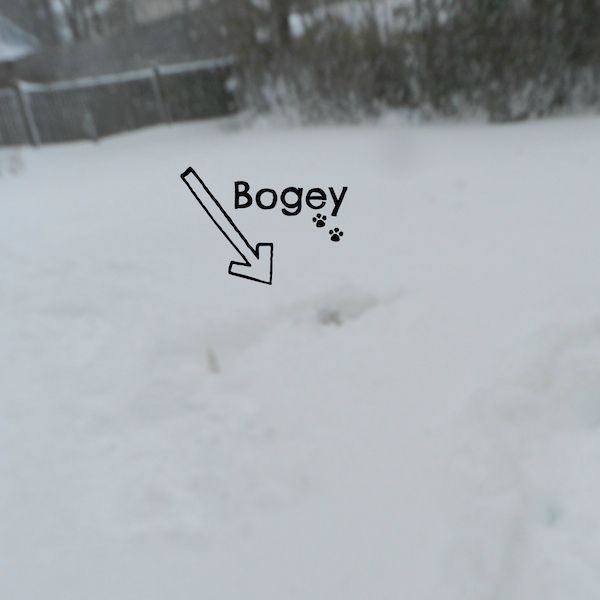 This being the first snow-filled Winter for my two dogs, I have done a little research to make sure they are safe from the unpredictable weather conditions. 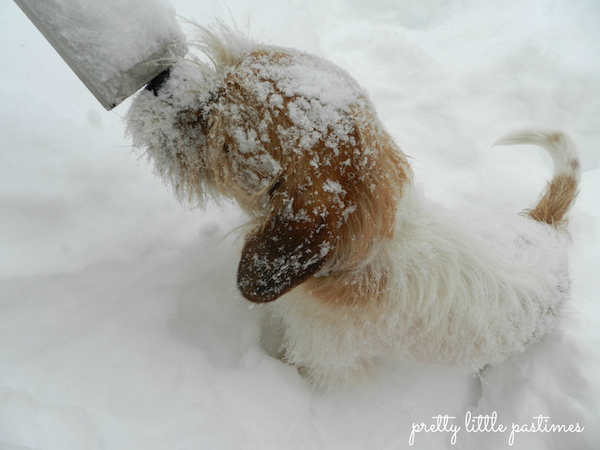 I wanted to share with you some Winter Care tips for your pups. Don’t leave them in the cold for long periods of time. Bogart and Maggie May play and chase each other until they are soaked, out of breath and ready for dinner! If I let them, I am sure they would stay outside until they were frozen solid. That is why it is important to make certain that when the temperature falls and the wind chill is high, that you don’t leave your dogs outside in the cold for long periods of time. Check on them often and make sure your little ones haven’t stepped a little too far into the deep snow. Make changes to their grooming for the season. Grooming can be especially important during the Winter months. 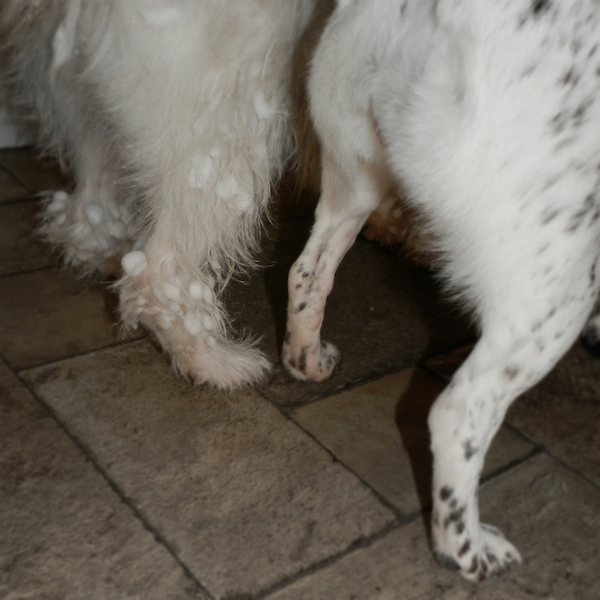 Maggie & Bogey are very different in their needs for grooming when there is snow on the ground. Maggie has very short fur on her paws which does not collect snow. Bogey on the other hand, has long hair around his front and back paws and when he comes in from a good play session, he looks like he is wearing boots! Snowballs of all sizes stick to his little paws and belly. As soon as he comes in, I make sure to wipe him down with a towel (gently, so it does not tug at his fur) and check his paws for ice. I then turn the kitchen faucet on lukewarm and put him in the sink to melt the snow slowly. You don’t want to use hot water to do this, since their cold bodies will be extra sensitive. Keep them hydrated and nourished. Even if they like to eat a little snow when they are outside, snow does not replace the need for fresh water. They may be soaked when they walk in, but make sure to offer them some good ol’ H20. During the Winter, your dogs are also burning more calories keeping their bodies warm, so make sure to adjust their diet/serving sizes accordingly. This is one tip Bogey does not have problem with! Carefully store ice-melting solutions. Anti-freeze, salts and other materials may not seem tasty to us, but for our curious four-legged friends, they might be worth a lick or two. Make sure to store these and any other hazardous materials out of your dog’s reach. Remember to check their paws regularly for salt and remove it immediately to avoid irritating/harming their pads. Pack an Emergency Pet Pack. When preparing for Winter storms and possible power outages, don’t forget to pack a Pet Pack. Keep an extra bag of food, treats and warm bedding ready for your pups. Double check that you have copies of important pet paperwork and prescriptions handy as well, so you can grab it quickly if you need to leave the house in a rush. Help them find their way home. Remember that rough Winter conditions can make it easier for dogs to lose their scent. Keep them on leashes when taking walks and make sure their identification tags are always secure and up-to-date. And lastly, HAVE FUN with your dogs outside! We had a huge snow fall, this last weekend and I took some time out to play with them in the fresh powder and snapped some pictures. They loved digging tunnels and running after flying snowballs. I can’t wait to turn some of these pictures into a Pretty Little Pastime!